Izquierda Unida MP Alberto Garzón debates the Catalan independence referendum with the CUP’s Pau Llonch. The October 1 independence referendum in Catalonia has prompted much discussion and debate on the Spanish left. Lacking international recognition and a legal basis under the constitution, the vote will be an act of mass civil disobedience against the conservative central government of Mariano Rajoy. But it will not be endorsed by the leading forces of the Spanish left, Podemos and Izquierda Unida, despite their defense of the Catalan people’s right to self-determination and opposition to the repression of the Spanish state. Instead, these parties, and their joint Unidos-Podemos slate, have tried to carve out a middle road in the confrontation, recognizing the vote as a legitimate form of political mobilization, but one which is designed more as a show of strength by pro-independence forces than a genuine referendum. In contrast to the October 1 vote, a recent article by Pablo Iglesias and Xavier Domènech, head of Podemos’s regional ally Catalunya en Comú, reaffirmed their commitment to a legally binding referendum as part of a wider constitutional process. This would aim at instituting a plurinational, federal Spain; an option they say is excluded by a simple in-out referendum. But these proposed changes seem a long way off, especially considering that any reform of the Spanish constitution requires a two-thirds majority in both chambers of the parliament. Faced with criminalization by the Spanish state and a campaign of denunciation from the country’s political establishment, the pro-independence left in Catalonia has vociferously backed the referendum. The upsurge in support for independence can be traced back to the 2006 Statute of Autonomy for Catalonia which, after being watered down by the Spanish parliament, was finally rejected by the Constitutional Court in 2010. In the wake of this controversy, and under the effects of austerity, those backing independence more than doubled (from below 20 percent to over 45 percent), while two left-wing independence parties, the social-democratic Esquerra Republicana (ERC) and the radical Candidatura d’Unitat Popular (CUP), gained ground electorally. Having backed a broad pro-separatist regional government led by the right-wing Partit Demòcrata Europeu (PDeCAT) in 2016, ERC and the CUP have promised independence within eighteen months if there is a yes vote in October. As tensions increase ahead of the vote, economist and CUP activist Pau Llonch and Izquierda Unida MP Alberto Garzón discuss how the Left should approach the question of Catalan self-determination. The following is an edited translation of an exchange which appeared in Publico. Let me start by saying that I count myself among your many admirers. I first discovered your theoretical brilliance in a 2014 article dealing with capitalist crises from a heterodox perspective and realized you were something more than a post-15M media figure; you were a Marxist and materialist who did not hesitate to call himself a Communist. So it was a massive disappointment this week to read of your stance towards the democratic process in Catalonia. 1. Starting with the question of class. Practically the entire Catalan bourgeoisie is opposed to exercising the right to self-determination, to the referendum in October, and to independence. Your own work has demonstrated to many the need to offer a complex class analysis and I myself have used your classification of the seven classes of modern capitalist societies in my work. But where is this complexity when you conceive of the referendum as in line with the Pujoles (i.e., the Catalan elites)? The concrete reality is that the main business lobbies, the Caixa and Sabadell banks and La Vanguardia newspaper, are all opposed to the referendum. No relevant actor from among what you describe in your article as the three primary sectors of the bourgeoisie (parasitic, fictive, and investment capital) support the vote, and only a sector of the small and medium bourgeoisie are in favor. We are clearly dealing with a national-popular movement whose support cuts across class boundaries, as is always the case in democratic revolutions. In the political sphere, only a section of the Catalan right, within the declining PDeCAT, support the referendum without reservations. Yet from emancipatory organizations such as Embat through Revolta Global and CUP to the social democracy of Esquerra Republicana, the pro-independence left supports this referendum unreservedly. 2. We defend concrete possibilities in contrast to your abstract alternatives. Since you demand concrete analysis, there is an alternative in the institutional sphere which has the potential to become hegemonic in a Catalan Republic: the combination of Catalunya en Comú, Esquerra Republicana, and the CUP. Unlike at the level of the Spanish state, we could even afford to sideline the center-left Socialist Party. This does not guarantee the eventual construction of socialism in Catalonia, which will depend, as always, on what happens in the streets rather than the institutions, but it would offer an opportunity to continue the fight for possible alternatives in the current phase of post-crisis capitalist reorganization. I remember Jaume Asens who now sits on the Barcelona municipal government, arguing that the movements’ strategy of an “assault” on the institutions could serve as a possible example for other European cities. Could this potential future alliance not perform a similar function: offering an alternative to a Europe plagued by xenophobia and fascism? By contrast, your own position can only provide an abstract defense of the right to self-determination. In requiring a reform of the Spanish constitution and given the negative public opinion [towards a Catalan referendum in Spain], such a scenario is only conceivable over a period of decades. Most importantly, our route to self-determination is not dependent on the permission of either Rajoy or the Spanish state, nor yours or Pablo Igleisas’s consent. Who is more concrete and who is more abstract? 3. At the core of our sovereigntist movement is the desire to secure social and political rights; the chauvinist and identitarian elements are completely residual. Though you might struggle to understand this, hegemony in this country has slowly shifted to the left since the start of the drive for independence. But one has to concentrate on the actions and discourse of those on the streets and in the Catalan parliament, and not on the prejudices of the Spanish left, to see it. Catalan premier Puigdemont has said that, unlike his predecessor, he had never used the phrase “Spain robs us” and that it should be banished from the lexicon of the social majority. Instead, in the current phase, the sovereigntist movement takes its cue from campaigns such as the recent Freedoms (from exclusion, poverty and inequality) which was led by the CUP’s David Fernandez (an anti-capitalist who had the highest public approval when he gave up his seat in 2015 — another anomaly in a country supposedly conned by its elites). Although it was struck down by the Supreme Court in Madrid, the Catalan Parliament felt obliged, given the current common sense in our country, to approve a law banning housing evictions. It has also passed legislation for a guaranteed basic income and prohibitions on immigration detention centers and the use of rubber bullets by police. Can you imagine a political majority for such measures in the Spanish state? No, me neither. 4. There is no alternative to a democratic resolution to this conflict but such a resolution is not possible within the Kingdom of Spain. The ’78 constitution was founded on three pillars: capitalism as a mode of production, the monarchy, and the denial of self–determination. After fourteen formal petitions to hold this referendum and seven years of sustained mass mobilization, no alternative exists but to exercise our inalienable right to self-determination on the basis of our capacity for resistance and struggle. Given the authoritarian nature of the Spanish state, there is no route to federalism that does not first imply being independent. In the words of David Fernandez, if we lack a democratic path to independence, we need an independentist route to democracy for all the peoples of the state. It is this materialist analysis that has brought many nationalists to fight for this referendum. Have no doubt that if the popular verdict comes out against independence, we will continue to support people like you in your efforts to reform the corrupt Spanish state. We only demand reciprocity. 5. The Left should demand guarantees . . . but from the state. Izquierda Unida’s position is indefensible. You demand a referendum with legal guarantees and based on a broad political consensus but these demands are directed at the Catalan government and not at the anti-democratic state that is blocking them. Such a position also forgets that every democratic revolution has taken place in defiance of the law, rather than in accordance with it. 6. The referendum has the capacity to clarify the lines of social division. This is the argument put forward by your comrade, the Catalan Communist Manuel Delgado. The failure to recognize the right to self-determination has created unnatural divisions among the popular classes and the referendum can break with these. By opening up a constituent process, our hope is that it will allow us to continue disputing the bourgeoisie’s hegemony but free of such distortions. In Marx at the Margins, Kevin B. Anderson asserts that Marx’s internationalism was never conceived abstractly but, as can be seen in his support for Irish and Polish emancipation, took very concrete forms. Hopefully you will begin to apply the same rigor to analyze the national question as you have in your work on political economy because you cannot hope to move beyond abstractions towards the concrete historical reality of our democratic revolution while you continue to evoke the name of Jordi Pujol [historic leader of the Catalan center-right]. Here my opinion coincides with one of the best Marxists we have produced, Francisco Fernández Buey, who recommended reading the classics not as sources to be quoted authoritatively but as the inspiration for a plural and heterogeneous tradition that has always been attentive to the historical moment. Otherwise we run the risk of interpreting the Marx quote at the top of Llonch’s piece, as well as his position on Scotland or Ireland, without their singular historical context. Furthermore, our classics also contain numerous contradictions. Who can forget Marx’s position on the brutal colonization of India where England’s role was defined in terms of it being an “unconscious instrument of history”? Engels also justified the US “war of conquest” against the Mexicans, wondering if it was really “unfortunate that California has been taken away from the lazy Mexicans, who did not know what to do with it.” And what can be said of the Second International? At its Fifth Congress, it recognized “the right of those from civilized countries to establish themselves in countries whose population remain at a lower stage of development.” In short, what we need is a concrete analysis of the concrete situation rather than the scholastic reading of Marxism. 2. The category of the nation. As a non-dogmatic materialist, I operate on the basis that nations are social constructs or, as Benedict Anderson put it, imagined communities. Being Spanish, Catalan or French forms part of our belief systems that are consolidated or shattered by historical circumstances and personal developments. This is not a question of science but rather of politics. I won’t debate the objective validity of a person’s belief in their Spanishness or Catalan identity, but I will debate its capacity to operate as a form of mediation with respect to political objectives, be it socialism or simply improving living conditions. That is why it is absurd to lump all nationalisms together. German nationalism in 1914 or the National Catholicism of Francoist Spain are not comparable with the nationalism of the anticolonial struggles of the mid-twentieth century or the national liberation struggles of the Latin American peoples. From this we can grasp our first conclusion: the right to self-determination is not an end in itself; neither, in my opinion, is the right to independence. It depends on the concrete reality. 3. A people is also a social construct, which means the recognition of its existence is a political act. I, for example, recognize the Catalan people, a people whose institutions (language, culture, norms, etc.) stretch back beyond 1713 [the end of the war of Spanish Succession]. Undoubtedly, the fact that Spain was governed for so long by the Austrian dynasty and not by the Bourbons influenced the development of the Catalan people. But it should also be remembered that the bourgeoisie is responsible for building the state, not a people. Hence there is a Catalan people constituted by those from below as well as one created from above. The former’s spirit can be traced back to the tragic week of the 1909 general strike and to the defense of Barcelona during the civil war. 4. The recognition of the right to self-determination is a basic principle for Marxists. As Manuel Sacristán said, “no national problem has a solution outside the context of self-determination.” Although peoples and nations are social constructions, they operate in reality as if they were objective entities, with their actions producing real effects. When a people enters into conflict with another, whatever the causes, the only resolution is dialogue and negotiation. Granting the same abstract condition to both Spanish and Catalan nationalism, we cannot take the side of one at the expense of the other. Instead it is possible to open up institutional channels to resolve the conflict, above all by recognizing the right to self-determination which is implicit in any process of dialogue between peoples. 5. Defending the right to self-determination is compatible with a federal model. As this right is not based on the belief that all peoples have to be independent, it is compatible with defending a federal state. This means nothing more than defending the coexistence between peoples in the framework of common institutions, ideally based on principles of fraternity and self-government. Such fraternity, as Antoni Domenech explains, comes from the republican-socialist tradition and has inspired, among other things, internationalism. A federal state that recognizes the peoples and nations of Spain rather than setting them against each other is a beautiful aspiration. And it is also possible. 6. Is it possible not to be an independentistafirst? What Llonch proposes is that given the authoritarian nature of the Spanish state, it is impossible to be a federalist without first being an independentista. Something like: I would like to be a federalist but they make it impossible. There is some truth here, i.e., the reference to the authoritarian nature of the state and its two main parties. It is the PP and PSOE who together blocked the possibility of developing the institutional channels needed to deal with the conflict, such as by holding a referendum. But the growth of the independence vote in recent years has not only been due to this impasse. Instead the national question has also been used as a populist channel for the frustration generated by the crisis and capitalism. Independence has been presented not as the democratic right of the Catalan people but as the solution to a set of economic and social evils. The Catalan right recognized that flag waving can offer effective cover in times of crisis. Although the argument “Spain robs us” is no longer voiced, there is undoubtedly an economic undertone, inspired by the Catalan right, which understands being linked with less developed areas of the Spanish state as a liability. 7. The need for guarantees goes beyond the question of legality. When we say that the process has no guarantees, we are not referring to its legality, as if our priority is respecting the regime of 1978, but to its usefulness as a mechanism for resolving the conflict. It is not only that the federalist option has been neutralized but that the vote is being used more as a political weapon than as an instrument to channel the conflict. The disputes within the Catalan government over how to carry out the referendum suggest few believe it will amount to much. It will be a show of strength; legitimate, but of no practical use. What must be guaranteed is that when the Catalan people are consulted, they can express themselves clearly, giving their opinion after a serious and rigorous debate. The right to self-determination can indeed clarify social divisions but not in the form proposed in October. Those people who want to vote for a firm break with the regime of ‘78 without voting for independence also have to have their own space. 8. It is not a good idea to underestimate the strength of the Catalan bourgeoisie. It is true that a considerable part of the Catalan bourgeoisie does not seem to support independence, and it is also true that tensions flared up within the old center-right Convergence and the new PDCat. But I find it difficult to believe the Catalan bourgeoisie is so inept as to leave the process in the hands of subaltern forces. We have seen over the past five years that it is the Catalan elites who still govern and, in terms of the route ahead, I’m not sure who is controlling whom. Clearly there is a coalition of forces able to pass anti-eviction laws and this is very positive. But I do not see how this justifies independence. There have also been anti-eviction laws in Navarra and in Andalusia and in all cases the 1978 regime, via the Constitutional Court, has overturned them. However, this leads me to think of the common enemy, not of the independence of one of the parts. 9. Is the referendum the best way to break with the regime? That seems to be what Llonch and many others on the Left are arguing. The problem is that even assuming independence is the best way to break with the regime (something I do not accept, since the regime is constituted to defend a mode of production and a set of power structures, which are not going to be altered merely by the existence of more states), it is not our process. We do not control any of the parameters of this rupture. Anything could happen in this scenario with nothing decided in advance. Would our compañeras in the CUP govern in a post-independence context or would it be the Catalan right in control? Would independence relaunch the forces of rupture in the rest of the state or lead to their retreat in the face of a resurgent Spanish nationalism? The Brecht quote with which I opened this piece was not chosen for nothing. 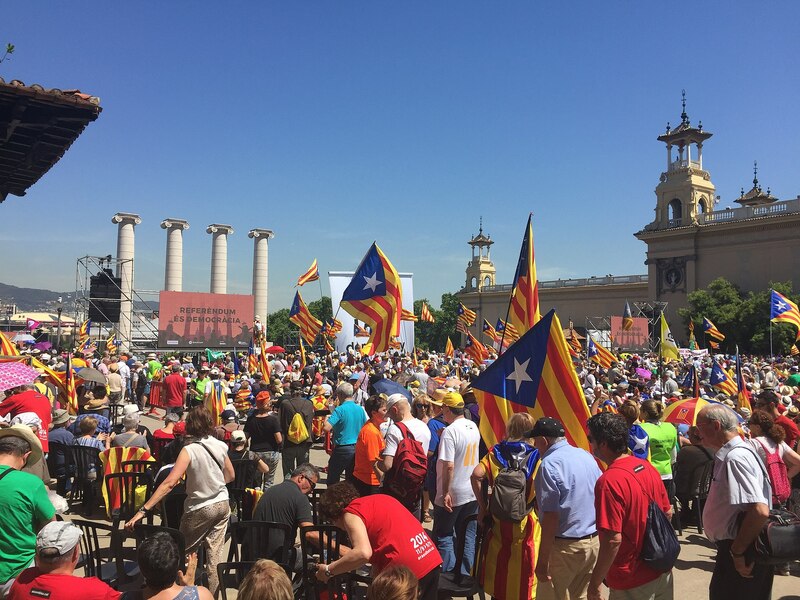 I am convinced that Spanish nationalism has created thousands of Catalan nationalists; however, Catalan nationalism is also generating further national sentiment across Spain. Locked in this dilemma, what comes to mind are the fateful events of 1914 when German and French Social Democrats betrayed their class so as to defend their nations. By contrast, I would prefer to think through formulas that would allow us to talk of a democratic and social rupture through which those from below among our respective peoples could work together. To conclude, capitalism forces the popular classes to compete against each other as much in the productive sphere as in other spaces. We compete for jobs, for access to services, for social status. The great writers in our tradition (Marx, Engels, Luxemburg, Lenin, Gramsci, etc.) knew this very well and understood that social class is both an objective fact — based on the position we occupy within the productive sphere — and also something that is socially constructed. Thus, for example, the term “class formation” was given to the process of constituting organizations such as parties and trade unions. When we organize we are doing more than coordinating: we are declaring what we have in common before a system that divides us. This is how an “us” is constructed that manages to avoid a “war between the poor”, which is the standard situation under capitalism. “Workers of the world, unite” was not only a slogan of enormous dignity, but expressed the universal within a specific situation — that of the dispossessed and suffering part of humanity struggling to emancipate itself from the realm of necessity in all parts of the world. This is my focus, the abstract part of my worldview which is crystallized in concrete analysis. In terms of the Catalan question my position is clear: the right to self-determination and a federal republic. And socialism without borders as well. Pau Llnoch is a Catalan economist, a hip-hop artist, and an activist with the Candidatura d’Unitat Popular (CUP).